Australian Dust Control has a dust collector to meet every need. Australian Dust Control is dedicated to offering their customers the very best in quality and design for their dust collector requirements. Australian Dust Control will design the most energy efficient dust collector on the market at the most competitive price. 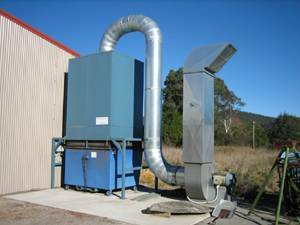 The Woodage, at Mittagong, had a Shaker Dust Collector designed and installed by Australian Dust Control. The Woodage is a well known joinery manufacturer specialising in the crafting of furniture made from exotic hardwood timbers. They were re-locating their factory to a larger site & needed Australian Dust Control to upgrade their individual mobile bag dust collector system to a more efficient dust collector system. A Shaker Dust Collector was the most suitable dust collector to meet their needs. The Shaker Dust Collector installed for the customer by Australian Dust Control gave them one central dust collector with a greater capacity. The Shaker Dust Collector had a 30 kw fan which had a sound enclosure to guarantee quiet operation. The waste product of sawdust and shavings produced from the manufacturing process was discharged into a 3 cubic metre tipper bin. Australian Dust Control is continuing to increase their presence in the Australian market place with the Shaker Dust Collector being just one in their dust collector range. The Shaker Dust Collector was the best option for this customer. However Australian Dust Control has a diverse dust collector range which can be tailor made to meet individual needs.